With the rise in "multiple careerists", "portfolio careers", and the "gig economy", as well as the rapid pace at which individuals now move from company to company due to mergers, acquisitions, layoffs, buyouts and busts, more American workers end up with a diverse set of work skills. Some workers may feel this presents an "awkward moment" when faced with the challenge of building a website — or a resume — to showcase their veritable kaleidoscope of abilities. I suggest such gifted and talented individuals look for the "red thread" — - the common thread that ties those various skills together. 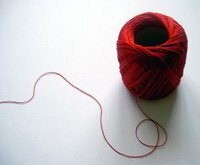 My "red thread" is —WORDS. As in —COMMUNICATION. Public relations/communications — clear, informative and interesting words. Hypnotherapy — words whispered into the "third ear" of the subconscious to create positive change in one's conscious awareness. If you'd like to learn more about training programs I've designed and delivered, click on Training. If you'd like to see samples of my writing in the way of by-lined articles, press releases and other public relations work, click on Public Relations. And if you are curious about hypnotherapy, (and you know you secretly are, no matter what brought you here in the first place), click on Hypnotherapy. When you've decided I'm the person who can help shape your ideas into words and images that go out into the world to create awareness, action and change, either to educate or to inform, then please click on Contact Me. And, if for some reason you haven't made the decision that I'm the right person for what you had in mind, still Contact Me. Ask me the questions that stand between our working together.